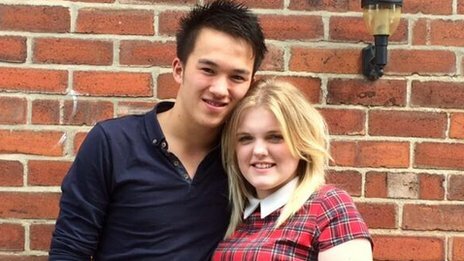 Zach Selby collapsed during a camping trip in Lincolnshire and his girlfriend Chloe Tones, 16, gave him CPR for 40 minutes before an ambulance arrived. Mr Selby, from Grantham, said he had been suffering with chest pains shortly before collapsing. 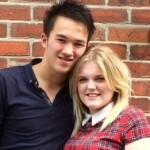 Miss Tones said paramedics had praised her for saving her boyfriend’s life. Mr Selby said after drinking with friends at the campsite last weekend he had “an unbearable pain” in his chest and decided to go for a walk. When he failed to return the group went searching for him. They spotted a mobile phone light in a park nearby and found Mr Selby on the floor by a bench. “It was awful…finding him lying there flat on the floor not moving, I didn’t know what to do,” said student Miss Tones. “It’s like I clicked on and was in the mode, all the adrenalin’s kicking in. If I hadn’t seen the flashlight I wouldn’t have seen him. “I ran over, I picked him up, I was shaking him, there was nothing. He was all floppy. No sign of him living or anything. “I was all over the place. I kept thinking ‘oh my god he’s dead, he’s dead’.” The group dialled 999 and an ambulance operator instructed Miss Tones over the phone while she started CPR.